Self-driving cars could mean better public transit, more green space and less congestion. But also: more urban sprawl and greater inequality. .
As the arrival of driverless cars gets closer, cities are scrambling to get ready. 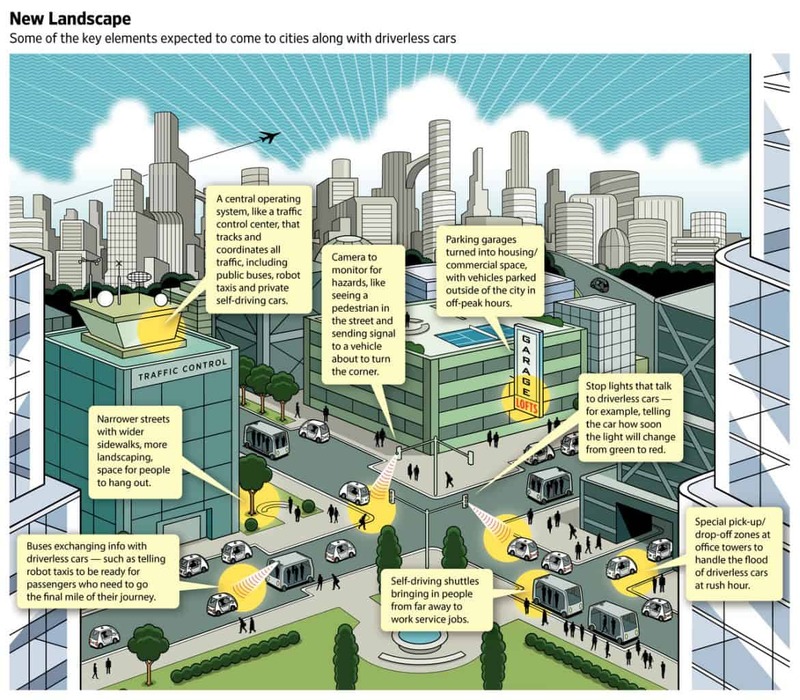 And for good reason: The driverless car promises to reshape the urban landscape as we know it. Little wonder, then, that the potential changes are creating excitement—and fear—among city planners. As they host test fleets of robot vehicles and figure out how to rework ordinances to prepare for the autonomous future, they’re imagining what life is going to be like when the streets are filled with cars that can largely think for themselves. Some see an opportunity to create on-demand public transit that gets people where they’re going faster and reaches more of the population. Or open up streets for more green space and greater walkability. Or redirect traffic to make it easier to hold functions like farmers markets. But, even as they acknowledge the promise, others see possible problems. They warn that robot cars could encourage greater urban sprawl and cut into funding for public transit, widening the divide between the haves and have-nots. And driverless cars won’t be replacing all human-driven cars overnight, meaning an awkward mix of robots and humans sharing roadways. Whatever the future holds, it will very likely be arriving soon. Here’s a look at some of the changes that may be in store for cities. Some urban planners envision integrating autonomous cars with existing public transit, making the whole system more flexible and responsive. A likely starting place is on-call robot taxis married with smartphone apps that let users plan the most efficient routes across town. For instance, a commuter might check the app and see that the quickest path is taking a rental bike to the train station, riding for 20 minutes, then finishing up with a robot taxi for the final 2 miles to the destination. In another combination of autonomous vehicles and transit, vehicles would actually anticipate commuters’ needs. The startup Moovit, which tracks anonymized user data to create a real-time picture of public-transit use, could use such data to help robot taxis know where and when to deploy to meet demand, predicts co-founder and Chief Executive Nir Erez. The operating system might see that 300 people are on board a commuter train set to arrive at noon. So it would send enough robot taxis to the station to cover the probable number of taxi riders, based on past usage statistics. Robot cars could also help riders in underserved areas. After being used for private trips during rush hours, the cars could be deployed in parts of the city with limited public transportation so that residents could use them for essential travel, perhaps even subsidized by the city to reduce cost. These setups offer a rare chance for a strong public-private partnership in transit—because companies have a financial stake in keeping the cars as full as possible, just as cities want to offer residents as many commuting options as they can. For cities, which often don’t have the latest technology, creating the infrastructure to allow such a network takes preparation. In Las Vegas, Aptiv has joined with Lyft Inc. to test self-driving cars to better understand what’s required to make a ride-hailing system work with robots. “A lot of times, people completely overlook that the municipality will play a critical role in how all of this is implemented,” according to Mr. De Vos. One of the open questions about how the technology will ultimately be used is whether robot vehicles will be more like a public utility, with cities deciding where and when the vehicles operate, or whether these vehicles will be more akin to chauffeured cars operated by private fleets. In January, Ford Motor Co. announced it acquired a startup called Autonomic to help create a so-called Transportation Mobility Cloud that could essentially serve as an air-traffic control center for a city trying to manage different transportation providers, such as public buses and privately owned robot taxis. Traditionally, each mode of transportation has been trying to ensure it is working in the most efficient way possible, says Marcy Klevorn, president of Ford Mobility. Autonomous cars can drop people off and then go somewhere else to park—or to shuttle other people around. That means less need for parking space, which could open up huge possibilities for space-crunched downtowns. Some cities have as much as 30% of land devoted to cars for roads and parking, according to Brooks Rainwater, director of the Center for City Solutions at the National League of Cities. Some see the advent of autonomous cars as the spark to reimagine a city with pedestrians at the center of development—whether that involves making wider sidewalks, adding green space and parks or converting former downtown parking-garage towers into housing or retail space. Another change could be in the design of buildings. Half of a new building’s footprint is typically devoted to parking, says Ryan Snyder, a principal at consultancy Transpo Group and a faculty member at the University of California, Los Angeles, urban-planning department. If fewer spaces are needed for autonomous cars, those spaces could be turned into retail or living space—potentially leading to lower costs for residents and businesses. As autonomous vehicles take over the roads, they will learn to coordinate traffic flow. Autonomous vehicles could be directed to pull out of the way of emergency vehicles or public buses to create virtual lanes for those higher-priority vehicles, for instance. But cities could also begin to use streets and sidewalks in a more flexible way, changing the dynamic of communities, Mr. Snyder says. For instance, streets could more easily be used for events like farmers markets, because automated vehicles could find routes around the blocked-off areas without causing traffic jams. Sidewalks might also change in front of large office buildings, as robot taxis and shuttles pick up and drop off huge numbers of passengers. Planners may create wider pick-up and drop-off zones, perhaps indented to allow traffic to flow easily around them. The curbs may also have sensors that can notify an autonomous vehicle when it is safe to pull over, says Grayson Brulte, who advises governments on driverless technology. Some proponents of driverless cars believe the shared vehicles will cut down on clogged streets. Research by Larry Burns, the former head of research and development for GM and a consultant for Waymo, suggests that a community needs only a small number of robot taxis to handle its transportation needs. In research for Columbia University’s Earth Institute, he found that if a city’s population density is greater than 750 people per square mile—the level of most U.S. cities—then it can ensure service with a fleet of robot vehicles amounting to just 15% of its current total of conventional cars. In Austin, Mr. Adler says he’s generally positive about autonomous technology’s potential benefits but says he could envision it leading to greater congestion problems. For instance, he imagines a resident who typically takes three children to different events and runs errands in a single vehicle. In a future with driverless cars, the resident might decide to send each child to those activities in separate robot cars while using another vehicle to run the family errands. Governments, which already tax gasoline and car purchases, may likely turn to taxing autonomous vehicles for using the roads, through perhaps a usage fee. One idea that’s emerged is a so-called zombie-cars tax, which was first proposed in Massachusetts last year, that would aim to tax vehicles on a per-mile fee to avoid people letting their cars drive around empty. Mr. Snyder, the urban-planning consultant, for example, suggests cities might charge a fee to have curb access in high-traffic areas or give preference to vehicles with multiple people, such as a shuttle. While some believe enhanced public transportation will provide benefits for communities that have limited public transit now, others worry the technology might favor the rich. Similarly, Richard Florida, an expert in urban planning and a professor at the University of Toronto, expects that autonomous cars will push the poor from middle suburbs out to exurbs, because the ease of using the cars will lure wealthy people to move to suburbs that haven’t seen reinvestment in more than a generation. There are also concerns that self-driving vehicles will cost people their jobs, such as those who currently drive taxis, Ubers or public buses. But many companies believe that humans won’t be displaced entirely soon, noting that there will be a need for people to maintain the fleets and monitor them. Perhaps the biggest unknown for driverless vehicles—and the thing that could most delay their arrival—is safety, a renewed concern after a test vehicle by Uber was involved in a fatal crash earlier this year in Tempe. Columbus, Ohio, was picked in 2016 by the U.S. Department of Transportation as a test city for advanced transportation technology. The city planned to deploy an autonomous shuttle around an indoor-outdoor shopping complex. But it has reconsidered the route after realizing some of the current technology’s limits. The problem was that the vehicles they were looking at couldn’t go fast enough to keep up with traffic, and the city was concerned about the need to make a left-hand turn against traffic, a driving move that has proved difficult for developers to implement safely, says Brandi Braun, the city’s deputy innovation officer. The program is now re-evaluating where to deploy such shuttles. Mr. Higgins is a reporter in The Wall Street Journal’s San Francisco bureau. He can be reached at tim.higgins@wsj.com.